17 Best Shopify Apps in 2019 which you must try now! We have compiled a list of highlights, pricing plans and also some relevant additional information about the best Shopify apps of 2019. First of all, Shopify is the world’s leading eCommerce promoter. Using Shopify, you can set up online businesses and manage them. And Shopify not only enables you to bring your offline stores online, but it also allows to optimize your products, advertise your businesses, increase sales and help keep in touch with your customers with ease. And various in-house and third-party application help Shopify users in setting up, managing and promoting their businesses. Furthermore, Shopify has over 1200 apps. There are paid Shopify apps as well as free Shopify apps. 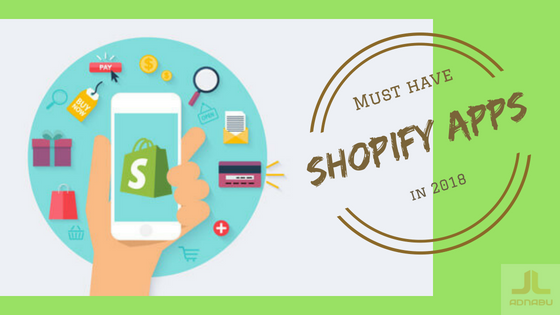 It is difficult for users, especially who are new, to find the best Shopify apps that best fit their requirements. Which is why I have compiled a list of some of the most reputed and useful apps that every Shopify user should at least give a try. Google Ads offers versatile marketing solutions for all marketers without a bias. However, for a new Shopify store owner, it can be a bit of a task to get started with Google Ads. From choosing between Search, Shopping and Display campaigns, to selecting the right keywords, then structuring the campaigns as per the best practices and of course, optimizing bids so that you don’t spend too much unnecessarily, it is all as important as running your store. AdNabu offers the perfect solution to your Google Ads woes. Google Ads optimization app by AdNabu also takes a majority of Google Ads responsibilities off your hands. Thus, you can concentrate on your store, products, and customers while AdNabu ensures that your Google Ads campaigns are running profitably. This app is one of the best Shopify apps of 2019. And it is a paid Shopify app. Easy integration. 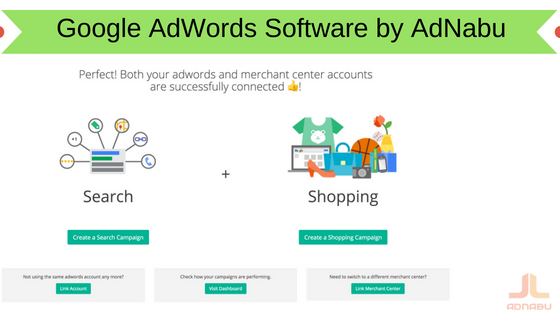 Link your Google Ads and Merchant Center account to AdNabu in less than a minute. View all your Google Ads metrics along with Search Term Analysis Reports, Audit Reports and Maintenance Job Reports that are exclusively available only on your AdNabu dashboard. Create Single Keyword Ad Groups for Search campaigns and Single Product Ad Groups for Shopping campaigns. You can also set automatic bid optimization for goals like Conversion Rate, Cost-per-Conversion and Sales Value by Cost. App also automatically sync new products in Merchant Center and create SPAGs for them. Segregate high-performing search terms from low-performing search terms for Shopping campaigns. Negative keywords discovery for Search and Shopping campaigns. A/B testing for landing pages and ad copies for Search campaigns. Long-tail keywords and negative keywords creation for Search campaigns. Besides, get all your performance reports on your email. 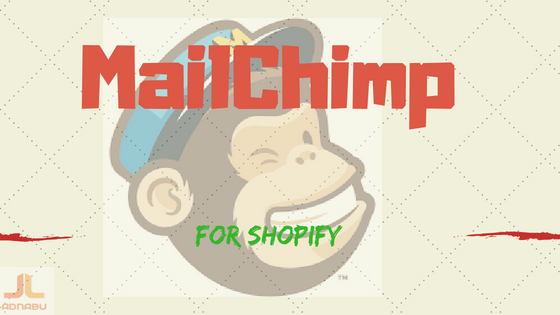 MailChimp is a free email marketing app for Shopify. You can integrate your Shopify store with MailChimp and run seamless email campaigns targeting customers with various intent. Firstly, one of the fundamental features of this app is that it adds new customers to your MailChimp email list automatically at the time of the checkout. This is one of the best Shopify apps of 2019. Synchronize email lists and customer purchase data. You can also set up email automation to remind shoppers about the products in the cart, products they viewed and follow up with them for product reviews post-purchase. Track and segment buyers based on shopping history and purchase frequency. View your email marketing performance on MailChimp Dashboard. You can also discover new customers, reconnect with existing ones, and direct them all to your website using Facebook and Instagram ads. Easy-embed pop-up forms to converts website visitors into subscribers. Add discount and promo codes created in Shopify to emails and avoid the content block. You can also create free, rich landing pages with product highlights, sales, and giveaways. Secondly, MailChimp is a free Shopify app. However, you will have to buy a custom plan with MailChimp to use all the features. Dynamic Remarketing takes your remarketing efforts a step closer to success. Your dynamic Remarketing targets customers based on their activity on your Shopify shops thereby showing them ads about products that they browsed. 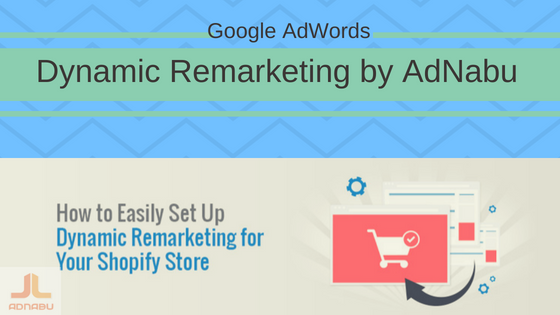 You have to set up dynamic remarketing campaigns for your Shopify store in Google Ads. You need a merchant center which links your products list and Google Ads. But this isn’t the toughest part. Implementing dynamic remarketing code and creating audiences to target, this is where it gets difficult. The dynamic remarketing tracking should be present on every page of your website, and standard implementation of the code might be prone to errors. However, you can tackle these problems with one of the best Shopify apps of 2019, AdNabu’s dynamic remarketing app. This app generates the code and implements it on all your web pages. It also creates audiences for your remarketing campaign in Google Ads. And you can create your remarketing campaigns using AdNabu’s app which is optimized following the best practices. This is a paid Shopify app. 3-step installation. Just download the app, connect your Google Ads and Merchant Center and create your dynamic remarketing campaigns. App installs dynamic remarketing tags on all your Shopify shop web pages. App also automatically creates audiences in your Google Ads. You can create Google Ads dynamic remarketing campaigns using the app. AdNabu offers a 3-day trial on this app. Regular pricing is $9.99 per month. Try the easiest way to create Dynamic Remarketing for eCommerce stores on Shopify. 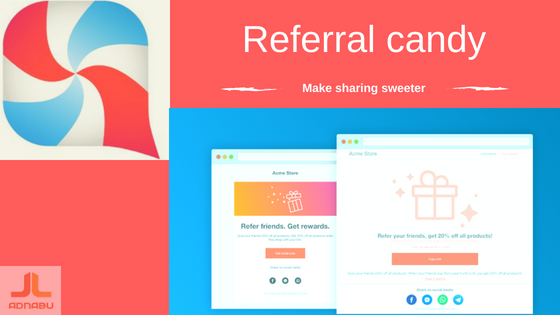 Referral Candy is one of the best Shopify apps of 2019. Brands like BlueSmart, Reebok, and Uniqlo, are customers of this Customer Referral Program service, and Referral Candy has been around for nine years now. ReferralCandy incentivizes customers on your behalf to share your shop with their friends and acquaintances with appealing referral programs. You can set up either cash or coupon referral program with ease. Even though it is a paid Shopify app, you get a 30-day free trial! One-stop dashboard for all insights. Customise either cash-type or coupon-type incentives. The best part is, Referral Candy also offers a 30-day free trial followed by which you have to pay $40 a month. Installing a conversion pixel to your Shopify shop is a hassle. Just the fact that you have to include the tracking code to every page of your website is exhausting. 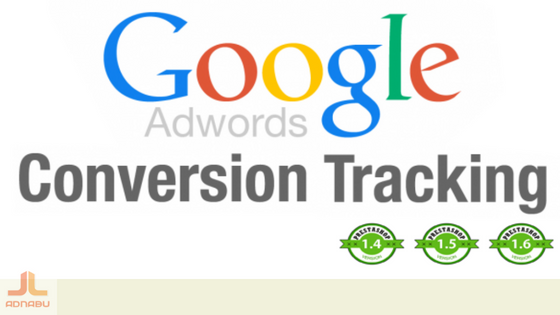 This conversion pixel and tracking code app automatically install the tracking code to all your Shopify webpages and also sets up a conversion pixel in your Google Ads where you can see your shop’s actual conversions. And by far, AdNabu’s conversion pixel & tracking app is one of the best Shopify apps of 2019 that does this. The simplest solution to all conversion tracking problems. And, you don’t need any knowledge of coding. One-click install. Your conversion pixel will be live in your Google Ads account once you download the app and link your account. The app also eliminates duplicate conversions, valueless conversions and fixes broke tracking pixels. This is especially relevant to every Shopify store owner because it is a free Shopify app. Just plug it and play. Loyalty programs work in a twofold manner, to retain existing customers and to gain new customers. Smile.io helps you chalk such exciting plans and execute them to keep your customers happy and leverage their connections to increase your sales. You can device various personalized reward programs for your customers. One such initiative is offering premium points when customers sign up. Rewards for following and sharing on social media, surprise giveaways on special days, etc. are some examples. You can get creative with your loyalty programs, and smile.io will help you implement them. Different reward programs to choose from. Advanced customization (visual) with provision to attach logos, custom images, and brand-based color schemes. VIP programs to encourage customer loyalty and segmentation. Also get API access to synchronize your data with other tools such as Facebook, Instagram, Twitter, Hubspot, MailChimp, etc. 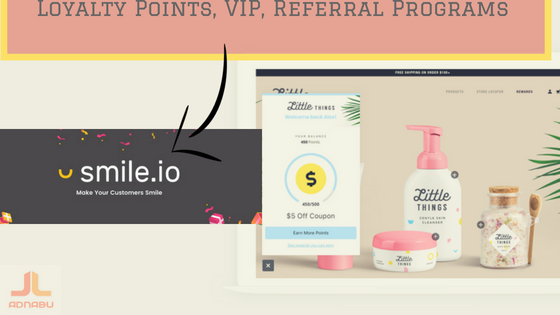 Smile.io is free Shopify app if your program is limited to 500 members or less. However, if you want to extend the limit, paid Shopify app plans start from $59 per month. Yotpo calls itself a customer content marketing platform. Are you wondering what customer content marketing is? Customer content is a combination of those reviews, photos, and feedbacks that your customers share. Leveraging this content to help promote your brand and sales is nothing but customer content marketing. It is one of the few and the best Shopify apps of 2019 which focuses on leveraging customer content. Yotpo has been helping various brands use customer content to build their businesses for over five years now. Yotpo is also a Shopify Plus Technology Partner. Therefore, it has earned an excellent reputation over these years. It is very often a problem when users don’t leave a review for our products. Reviews not just encourage new visitors to make a purchase, they also help us in improving our products and services. And yet, not all users leave a review. They either are busy, or they just forget. Either way, what if you can send our emails requesting their valuable feedback? Yotpo does just that, along with more features such as adding widgets your web pages with customer reviews, photos and other content that is relevant to users. Review Request Emails – Collect reviews with just one request. 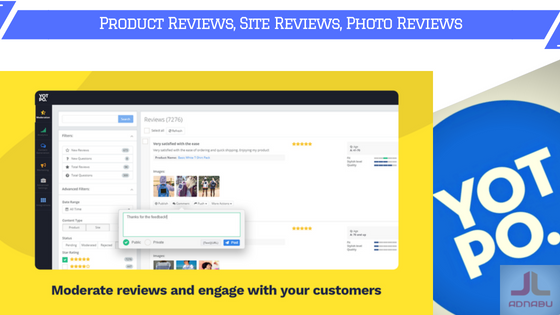 Reviews Widget, Reviews Tab & Star Ratings – Increase conversion rate with product reviews and rating exhibition. Advanced Moderation & Commenting – Decide what content to publish and where to post. Comment on reviews either publicly or personally. Social Push & SEO Page – Direct traffic from Facebook and Twitter. Also, leverage social impact on SEO to show higher in search results. Full Social Integration – Share your best reviews and ratings on your Facebook & Twitter pages. You can either choose reviews manually, or Yotpo’s smart algorithm can do the work for you. User-Generated Photos – You can also collect customer photos to create catchy visuals. Community Q&A – Answer consumer queries directly on the product page. You can also assign questions to previous users and request them to answer. Shoppable Instagram – Direct traffic from Instagram to your website. Turn your followers into buyers. Push to Pinterest – Pin customer photos on your Pinterest boards. Leverage Pinterest’s traffic. Product Recommendations – Upsell and cross-sell using product recommendations. Yotpo Ads – You can also use customer reviews to create ads on Facebook & Instagram. Yotpo has a free Shopify app as well as a paid Shopify app. Visit their pricing page for more details. Boost Sales by Beeketing is a cross-selling and upselling app for Shopify users. And it is undoubtedly one of the best Shopify apps of 2019. 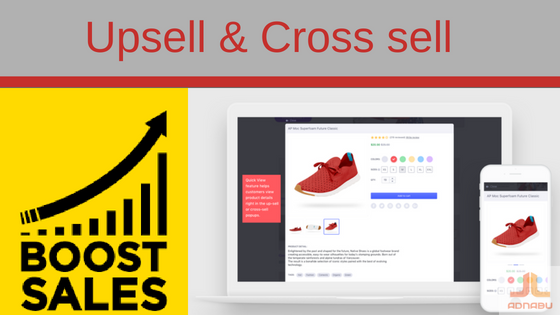 Upselling and cross-selling are one of the sales tactics made famous by big eCommerce stores like Alibaba, Amazon, eBay, Flipkart, Jet.com, Rakuten, etc. With Beeketing’s Boost Sales, you can also implement this efficient technique to entice your customers into buying more from your store. Boost Sales pops up alternatives and related products when a customer adds products to cart. You can customize the pop-ups manually or let the app do it for you. Boost Sales also uses your user data to recommend especially relevant products that best suit their interests. Cross-Sell: Recommend related products and combo-offers. Quick View: Show product previews on the same page. Smart Recommendations: AI-powered product recommendations. Sales Motivator: Video game-inspired smart coupon notifications on your website. Last Step Upsell: Targeted also upsell on the checkout page. Beeketing is a paid Shopify app, but it offers a 15-day trial of Boost Sales app. Regular pricing starts from $30 per month. Recart’s Messenger Marketing & Abandoned Cart Toolbox is the Captain Planet of Facebook for Shopify. It is a combination of seven apps in one. As you can see, this app uses Facebook Messenger as the platform to market products. Therefore, Recart boasts of 85% increase in the open rates. 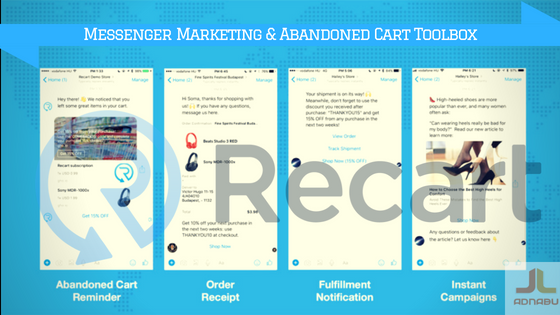 Using Recart, you can also leverage Facebook Messenger push notifications to reach out to cart abandoners and convey different marketing dialogues to your customers. Recart’s Abandonment Analytics gives you real-time information on your losses due to cart abandoners and the list of them for you to remarket. Add to cart pop-ups to help capture emails. Push notifications and user/login tracking. Also, send Abandoned cart email and create Messenger campaigns. Email capture from all your software. Form autofill (Only available for Shopify Plus). Recart also offers Abandonment Analytics. Recart is a paid Shopify app, but offers a 28-day free trial for new users. After that, Recart’s regular pricing is variable depending on the amount of money you make per month. 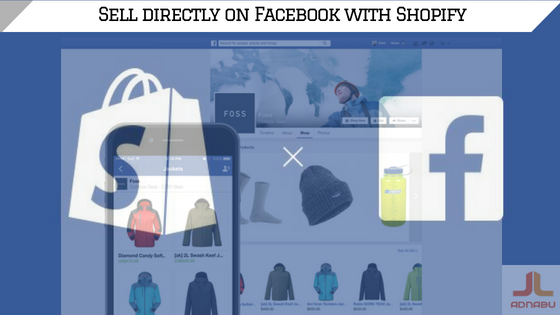 Using Facebook by Shopify, you can transform your Facebook business page into a Facebook shop. This app adds a “show now” button on your Facebook business page which allows visitors to make purchases directly from Facebook. This app is one of the best Shopify apps of 2019. 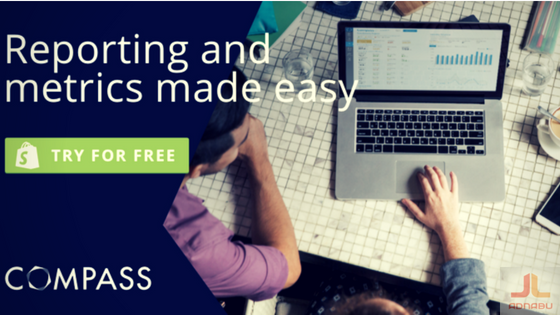 Easy: Hassle-free setup using your Shopify account. Save time: Product changes on Shopify automatically updates on Facebook. Stay organized: Manage your Facebook inventory and sales directly on Shopify. Customize collections: Customize what products you want to list on your Facebook page. Save and share: Customers can also spread the joy by sharing your products on their Facebook pages. Facebook by Shopify is a free Shopify app. SpurIT has some twenty apps on Shopify; each serves different user requirements. 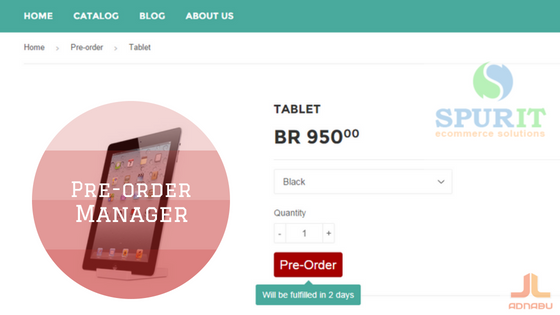 Pre-order Manager helps you track out-of-stock products. You can add a “pre-order” button for products that aren’t available. Users can order those products, and you deliver them as and when they are back in stock. Learn more about the app here. SpurIT offers one of the best Shopify apps of 2019 that does pre-order management. Tidio Live Chat developed by Tidio Ltd.
Tidio Live Chat is one of the favorite chat support applications on Shopify. Constant support throughout the customer journey is essential. Most customer, when they run into a situation, expect a prompt response. Otherwise, seven on ten customers leave your shop. Tidio Live Chat app helps you help your customers in such unfortunate situation. You can define a trigger point as to when a chat window pops up. You can include a custom message. For instance, if your customer searches for a product which is out-of-stock, a chat window saying “We are sorry, we sold the last piece of the product you are looking for. Can I show you more such products?”. You can then swoop in and recommend them some alternatives. This is one of the best Shopify apps of 2019. Data of visitors who are on your website such as browser and language they are using. 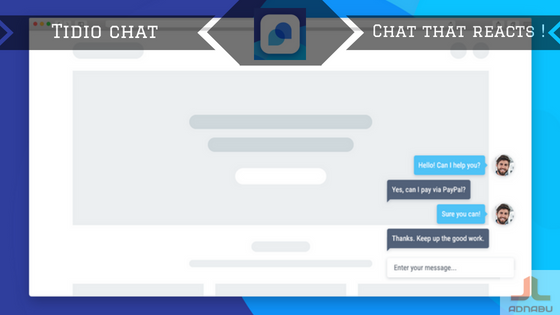 With mobile-friendly chat support, you can be in constant touch with your customers. They will also find it easy as they can access your support from all devices. Customers can also fill in their details on the contact form if your support is offline. Automated messages are customizable as per your requirement. Messages are shown in the language of visitors browser even if your language is different. Tidio Live is a paid Shopify app. The plan is just $15 per month. 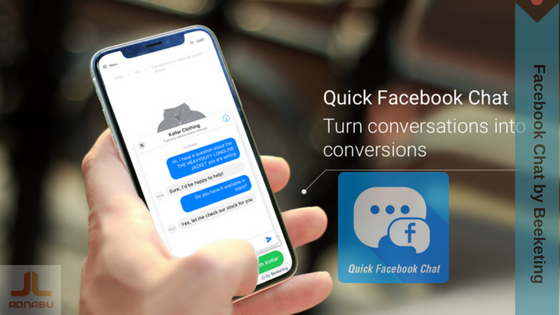 Facebook Messenger is now the most used chat service, and it is one of the best Shopify apps of 2019. Despite all the data-policies violations, users still prefer Facebook to communicate over emails and SMS texts. It only makes sense to leverage such a platform, right? Beeketing does just that. Using their Facebook Chat, you can talk to your customers through their Facebook accounts. You, as a store owner, have to install Beeketing’s widget on your website and link your brand’s Facebook page where customers can login with their messenger accounts and reach you out. Not just that, none of the previous chat histories is erased. Hence, you can always pick up where you left. Connect with your customers using Facebook Messenger which they are very familiar with. Facebook chat app works seamlessly across all kinds of devices. Help your customers even when you are on the go. You can also use customizable images, chat box layout, color scheme and placement on your website. You can install this app with just one click. No lengthy codes or integration time required. Beeketing’s Facebook Chat is a free Shopify app for customers. Oberlo is a drop ship product marketplace. Dropshipping is a business model using which you can send products to your customers directly from the merchant without you having actually to store or ship the products. And using Oberlo, you can also add products you wish to sell on your web store. Oberlo connects you to merchants from AliExpress and Oberlo. Oberlo automatically updates product details, inventory, and pricing. 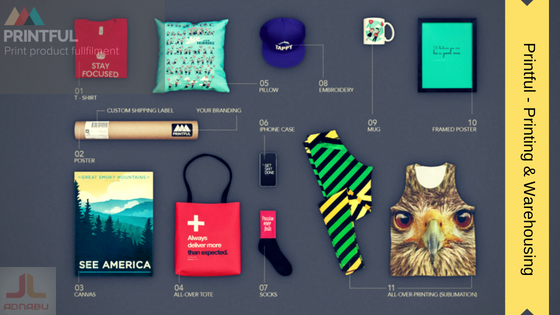 You can also customize product images, descriptions and titles as per your customers taste. Oberlo is one of the best Shopify apps of 2019. Easy-import drop-ship products from sellers on AliExpress and Oberlo Marketplace. Auto-update product inventory and product prices. Oberlo also ensures that out-of-stock products or products that aren’t profitable are restricted for purchase. Ship products to your customers automatically. You can also customize your product titles, images, and descriptions. And create custom pricing rules. You can also use multiple logins for your team to access your store hassle-free. ePacket filters help you pick products based on their delivery time. You can also link your existing products on Oberlo. Ditch a supplier if you don’t like the pricing or shipping or the product. And, no strings attached. Oberlo has a free Shopify app as well as a paid Shopify app. It offers a free plan, a basic plan, and a pro plan. The free plan has all the features, but the monthly orders are limited to fifty. The basic plan extends the order limit to five hundred; you pay $29.90 per month. You also get access to advanced shipment tracking and order monitoring. The pro plan, which is priced at $79.70 per month, offers you unlimited orders, multiple logins, and exclusive sales channels. Printful is an Oberlo-like app which earned its place in the list of best Shopify apps of 2019. It lets you sell print products such as apparels, accessories, kitchenware, collectibles, etc. It is a paid Shopify app. Also, you can check out their custom pricing here. 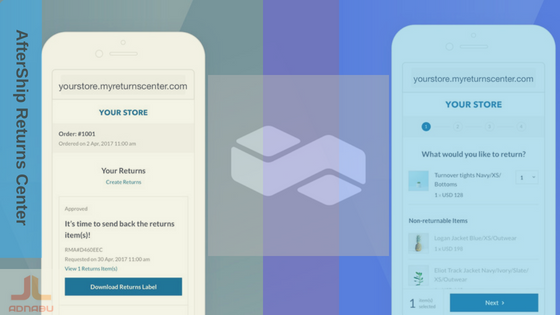 AfterShip currently has three apps on Shopify, and by far Returns Center is one the best Shopify apps of 2019 by AfterShip. Returns Center is return-order management tool. Customers often find it cumbersome and chaotic to return a product after purchase. Most businesses often lose customers for the same reason. AfterShip addresses this problem very efficiently. You can create return-order page on your website. Customers can place their returns with ease. Additionally, you can change and update your policies, accept and reject returns and track them using AfterShip dashboard. Quick automation of return-order process. You can also create custom returns pages to blend in with your website. Pre-built email templates to update customers on their return-order status. AfterShip Returns Center is a paid Shopify app with custom pricing plans. Visit the pricing page here. Shippo is an all-in-one shipping solution for Shopify stores. With tie-ups around the shipping industry, Shippo offers discounted prices for various carriers. Not just that, Shippo also has other handy features such as printable labels, partial order delivery, and shipment tracking. All in all, Shippo helps you find the best courier service provider for your store based on the type of products you wish to send, pricing, location, delivery-speed, etc. Shippo also automates paperwork and documentation for international couriers, and it is one of the best Shopify apps of 2019. Import product orders from various channels such as Amazon, eBay, Etsy, Magento, Shopify, and WooCommerce. You can also create automated rules for international deliveries. 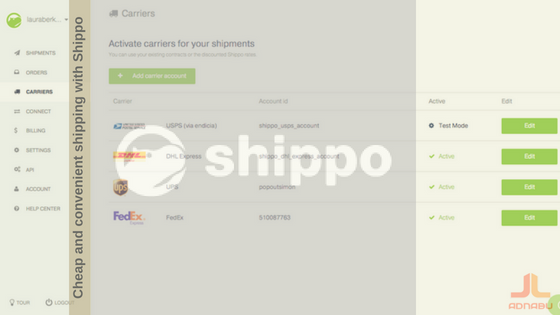 Integrate custom documentation, sales invoices and other workflows with your Shippo account. Divide a single order into multiple shipments. Send partially-met packages too, to different locations without any delay. Shippo also updates your Shopify regularly with courier tracking details and keeps customers informed. Customers get tracking information too. You can create and print shipping labels, invoices and packing slips in bulk. Shippo’s API is accessible for Shopify Plus users. Shippo is a paid Shopify app and follows an innovative pay-on-the-go pricing model. You pay Shippo $0.05 per label and the cost of the stamp. More pricing details here. Compass is the most widely used reporting app by Shopify users. And all for the right reasons. Compass lets you integrate different platforms such as Amazon, Shopify, Google Analytics, Facebook, Paypal, Google Ads, etc. to your Compass dashboard. You can view data from these platforms under one hood. Compass isn’t just a reporting app. It is building a community of a network of eCommerce company, mostly small and medium businesses. This helps you in comparing your data with different companies that are relevant to you, be it either competitors or industry leaders. The numbers make much more sense when you have a benchmark to draw parallels against. 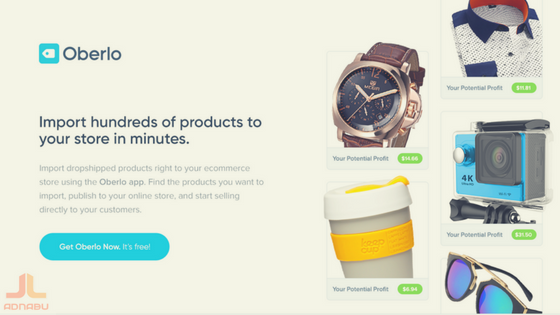 Compass is one of the best Shopify apps of 2019. Benchmark your performance metrics either against your competitors or industry leaders to identify strengths and weakness of your shop. AI-powered recommendations based on your historical data, industry trends, and standards which suggests your potential growth opportunities. You can also get robust reports of your customer acquisition channels, revenues, ROIs, growth opportunities for individual channels, Customer Lifetime Values, Avg Purchase Values, etc. Keep a tab on the performance of your teammates, determine drawbacks and set goals for the weeks and months. Compass is a free Shopify app. However, you will have to pay for most premium features to make the most of it. And we have a special mention to one of the world’s promising Shipping Software, Veeqo. Veeqo is one if the best Shopify apps tailor-made for multi-channel inventory management software. You can integrate Veeqo with your Shopify store and handle all your orders, shipments, and customers with ease. Veeqo offers Multichannel Shipping and Fulfillment which helps you ship buyer orders from any sales channel directly with just a few clicks. Veeqo integrates with the world’s leading courier service providers and makes it easy to ship to customers anywhere in the world. Veeqo’s Multichannel Inventory Management syncs your inventory across multiple channels, stores, e-commerce marketplaces, and warehouses in real-time. This is to ensure that you avoid overselling. Make a sale anywhere, and Veeqo instantly updates stock levels everywhere. You can also control how much stock shows for each sales channel. Multichannel Order Management from Veeqo automatically compiles orders from all your stores and sales channels into one easy-to-use platform. Veeqo is a paid Shopify app. Visit their pricing page for more details. The success of a business depends on various determinants. Hence, striking a balance between all these factors is the key to a sustainable and scalable enterprise. In this age of information and excess of supply, customers can jump from your store to your competitor’s in less than three seconds. Hence, it is no secret that you have to be on your A-game every day. And for that, it is a must that you use tools that help you achieve the goal. It is true that Shopify is one of the leading eCommerce promoters. There are numerous shops powered by Shopify. Thus, many technology-based companies have built their markets targeting these Shopify shop owners. Hence, there is an excess of applications on Shopify. In conclusion, the motive of this article (list of the best Shopify apps of 2019) is to highlight some of these countless apps that genuinely deliver what they promise. Some are old, and some are new. Let me know if you any of these apps has done something remarkable for you. Let me know even if it is otherwise. Note: I don't endorse any of the best Shopify apps of 2019. This data is purely from my primary and secondary research. For more interesting blogs on Online Marketing and Google Ads, be sure to visit our Google Ads and PPC blog.